At the American Society for Clinical Oncology (ASCO) Annual Meeting 2016, researchers present results of three clinical trials using new targeted therapies against triple negative breast cancer (TNBC). Each therapy uses a distinct strategy influenced by the immune system and all three have real potential to extend the lives of women whose cancers have progressed after previous treatments. "This is a disease in real need of a breakthrough. There's really not any drug specifically approved for triple-negative breast cancer," says Jennifer Diamond, MD, investigator at the University of Colorado Cancer Center, an author on all three studies. By definition, TNBC lacks estrogen and progesterone receptors and the overactive HER2 that drive other forms of the disease. 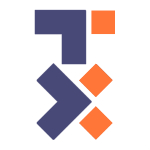 These three cancer drivers also present doctors with targets useful in controlling the disease, for example tamoxifen and fulvestrant block a cancer's ability to drive its growth with estrogen. Because TNBC lacks a known primary driver, doctors have lacked targets for new treatments, instead largely depending on decades-old chemotherapies, surgeries and radiation techniques. 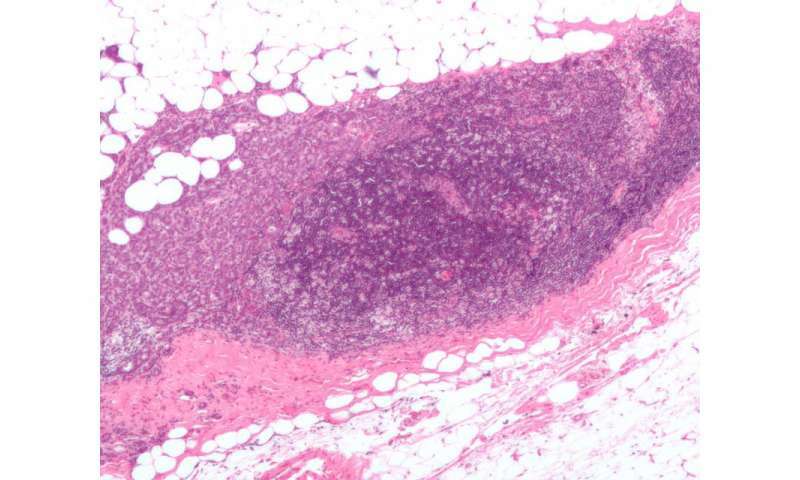 Now the first generation of targeted therapies for TNBC may have arrived. The first study reports the phase I/II clinical trial of the drug IMMU-132, which was recently granted "breakthrough" status by the FDA, meant to speed the approval of the most promising new drugs. IMMU-132 is an "antibody-drug conjugate" meaning that it is, in fact, two distinct pieces linked together. In this case, the drug is a molecule related to the chemotherapy irinotecan. And the antibody is a molecule that binds to the protein Trop2, which is overexpressed in about 80 percent of all TNBC. "The strategy is to use this Trop2 antibody to help irinotecan find and target the disease," Diamond says. The approach is similar to the mechanics of the immune system in which an antibody recognizes the surface proteins of a bacterium or virus and then directs a T cell to target invaders. Only, in the case of this antibody-drug conjugate, irinotecan replaces the T cell as the agent responsible for killing unwanted cells. The 48 TNBC patients treated with IMMU-132 had an average of four prior rounds of therapy, meaning that their heavily pretreated cancers had proven especially resistant to therapy. In this notoriously difficult group, there was a disease stabilization rate of 74 percent. Six months later, 37 percent of patients' tumors remained stable or better, with one complete response, meaning that after treatment, this woman's aggressive breast cancer became undetectable. The second study reports the results of a phase 1b study of the drug vantictumab. In the trial of IMMU-132, an antibody sought cell-surface proteins specific to TNBC, bringing with it the payload of chemotherapy. In the trial of vantictumab, an antibody again seeks cell-surface proteins, namely the proteins of the "frizzled" receptor. But instead of bringing a poison to kill TNBC cells marked with frizzled receptors, vantictumab simply attaches to these receptors, plugging their ability to catch other molecules, and thus muting signals that these frizzled receptors could otherwise have transmitted inside the cell. These signals are the problem - frizzled receptors are an essential link in the Wnt signaling pathway, which transmits growth and survival signals to breast cancer stem cells. Vantictumab silences frizzled receptors, which interrupts messages through the Wnt signaling pathway, which results in TNBC stem cells not receiving instructions to grow, survive and replicate. Of 21 patients treated on this phase 1b trial of vantictumab, 33 percent achieved at least a partial response. The third study reports the results of atezolizumab in combination with the chemotherapy nab-paclitaxel in patients with metastatic TNBC. Atezolizumab is a classical immunotherapy, one in a class of drugs known as PD-L1 inhibitors that counteract a tumor's ability to hide itself from the immune system. Basically, T cells have PD1 receptors that, when activated, turn off a T cell's cell-killing activity. Many tumors express PD-L1, which is the "ligand" that activates PD1, thus deactivating the T cell. Atezolizumab blocks the ability of PD1 receptors to bind PD-L1, thus leaving T cells able to target tumor tissue. "Many cancers are slow-growing and so when you see stable disease in trials of these cancers, you don't know if it's due to the treatment or to the fact that the cancer was going through a more dormant period. That's not the case with triple negative breast cancer. This is a fast-growing disease and so seeing prolonged periods of stability is a very positive result," Diamond says. In total, these three trials represent the transition of TNBC targeted therapies from years of work in the laboratory to promising results in the clinic. 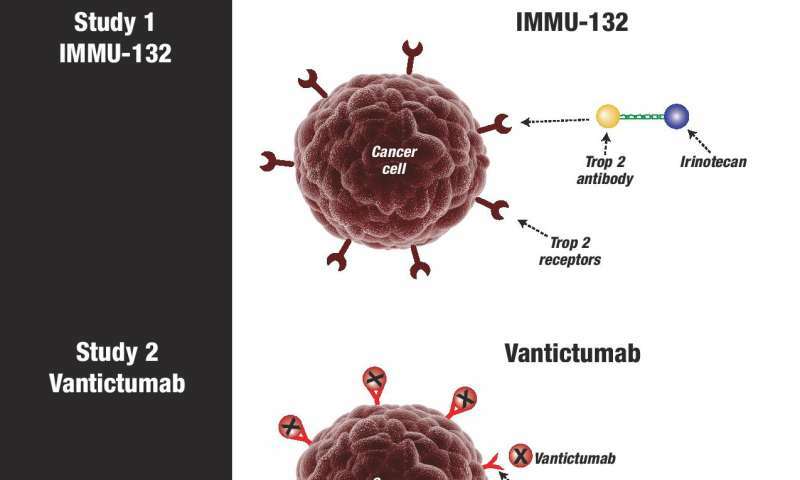 IMMU-132 is the closest to approval, but vantictumab and atezolizumab may also prove helpful. These three trials also demonstrate the clinical usefulness of strategies targeting cancer along the spectrum of immunotherapy, from the spot-on immunotherapy IMMU-132 that recruits T cells against tumor tissue, to approaches that are influenced by the mechanics of the immune system but do not directly co-opt its resources to fight cancer cells. "Patients and doctors have been waiting for these targeted therapies against TNBC. Now the first ones are in the clinic. I can't tell you how exciting this is," Diamond says. "These drugs or ones very much like them could be game-changers for triple-negative breast cancer."